To be successful, fishermen must understand how these features interact and affect the species they target and their fishing operations, and adapt their fishing plans and practices accordingly. The California Current System is a complex set of warm and cold water masses that create one of the most productive marine environments in the world. Its dynamic currents – including the California Current, the Davidson Current and the Southern California Countercurrent – influence the species available and their movements, both of which vary considerably along California’s 1,100-mile coastline (mainland plus offshore islands). Generally, the currents flow north or south parallel to the coast, at various depths, and sometimes in opposite directions from each other. These currents, along with other climatic conditions, influence water temperatures along the coast, with Northern and Central California generally having cooler water than Southern California. The Santa Barbara Channel area is a "transition zone" where these waters and associated species mix. 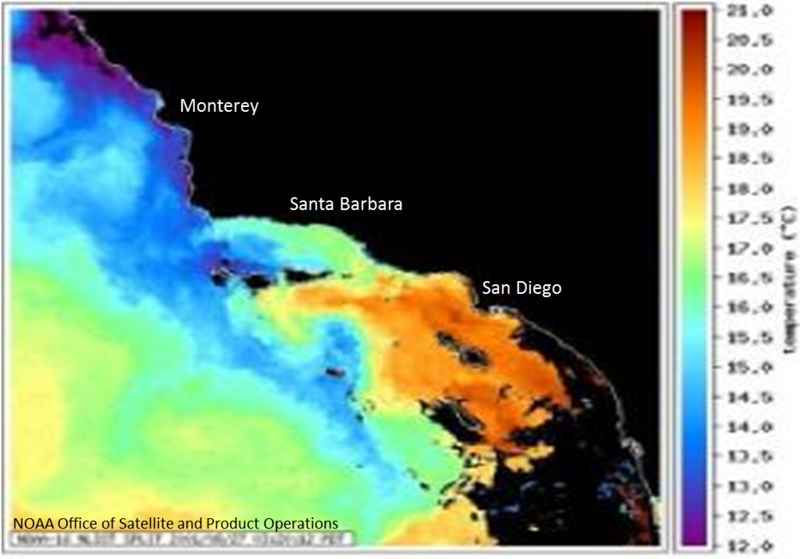 The satellite image to the left shows sea surface water temperatures for the California coastline from Monterey County to San Diego. Purple and blue colors denote the coldest water. Orange and red colors denote the warmest water. Oceanographers have detected two primary sets of oceanic climate patterns that affect the waters off the California coast: the El Niño-Southern Oscillation (ENSO) and the Pacific Decadal Oscillation (PDO). The ENSO cycle has two phases – a warm phase (El Niño) and a cold phase (La Niña) – where sea surface temperatures deviate from normal, particularly in the tropics and often extending northward in the Pacific Ocean. 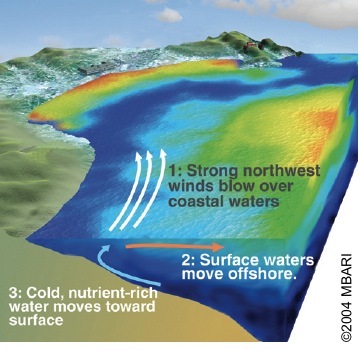 While ENSO conditions may cause extreme weather (such as floods or droughts), they also affect upwelling and other ocean processes along the California coast. For example, the reduced upwelling associated with El Niño events can sharply reduce ocean productivity, impacting fisheries. The quality of sea urchin roe (the part of the animal that is consumed) dramatically decreases, as kelp beds (their primary food source) dwindle with warm water conditions. The opposite occurs during the cold-water phase – the quality of sea urchins improves as kelp beds flourish. El Niño and La Niña events also can affect where marine organisms occur (e.g., water depth, distance from and location relative to the coast). For example, a scarcity of California market squid on their usual fishing grounds is strongly associated with El Niño events, while such oceanic warming tends to bring albacore tuna closer to shore. As its name suggests, the Pacific Decadal Oscillation (PDO) is a long-term (20- to 30-year) pattern of climate variability in the North Pacific that extends down into the tropics. Like ENSO events, the PDO has been characterized by cold eras (e.g., 1947-1976) that enhance ocean productivity and by warm eras (e.g., 1977-1998 and beyond) that limit it. In recent years, the long-term pattern observed in previous years has shifted to a much shorter-term pattern, including a shift occurring after as little as 10 months in 2010, with implications for the marine ecosystem and fisheries resources.